You can access the Settings sub-menu by tapping on the relevant Side Menu option or by, simply, swiping (left to right from left end) at any time. Use the Settings menu to define the OnCourse options and functionalities according to your needs. Tap on any of Settings categories to bring out the relevant options and customise OnCourse. This section contains information regarding your MarineTraffic account (username, subscription plan). You can also Logout by tapping on the relevant button or view the Terms of Service page at MarineTraffic. This section enables you to edit the details of your planned or current voyage. Once you are done, you can select whether you want to enter Cruise Mode immediately or later or view your Past Voyages. Position reporting to MarineTraffic - how often will your vessel's positions, along with other dynamic data (speed, course) be transmitted to the MarineTraffic database. Static info reporting to MarineTraffic - how often will your vessel's static information (name, type, draught) will be transmitted to the MarineTraffic database. Email notifications - how often will you be getting notifications to your registered email account when Cruise Mode is activated. Map View: change the appearance of the app according to the light conditions (Day/Night) or leave it up to the app to decide (Auto) based on your Local Time and Location - note that the Night Mode is particularly handy when sailing at night. Map Resolution: based on your device, the app defines the resolution of the Live Map. However, you can always change this setting - note that the higher the resolution, the more bandwidth the app consumes. All cruises info: view statistics regarding your recorded voyages with OnCourse (Cruise Mode ON). Based on your positional reports, you can see your Average and Maximum speed, total Distance covered and Time. Tap on the RESET button to start recording from scratch. Keep awake: this option defines if and when your device will be entering Sleep Mode. OS default will use your device's default setting. Choose at sailing to keep your device on when Cruise Mode is activated or always to keep your device on when the OnCourse app is running. Compass: select whether you want the OnCourse Compass to be displayed or not and the style of it (full/minimal). 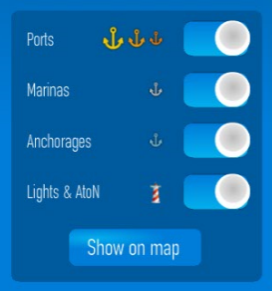 Nearby vessels info: select the pieces of that will be displayed regarding vessels close to your position. 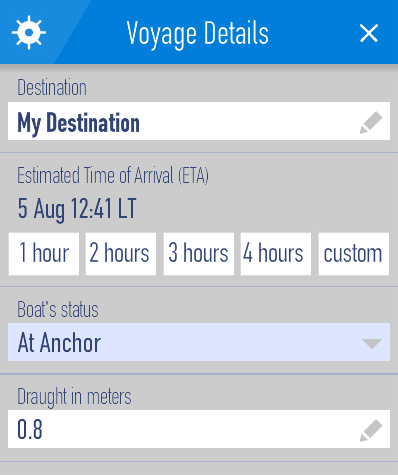 Place vessels at estimated positions: let the app estimate the positions of other vessels based on their latest AIS reports (during transmission intervals). Draw projected course: enable this option to view the projected courses of other vessels based on their recent AIS data (position, speed, course, heading). Use the slider to define the length of the projection time-wise (from 1 minute up to 2 hours). Speed units: choose between knots, km/h, mph. SOG extra info: select the default info that will be displayed on the SOG (speed-over-ground) indicator when Cruise Mode is activated. Note that you can also change the displayed info by simply tapping on the SOG indicator at any time. Speed vs Detail: use the slider to choose whether you prefer the app to be optimised for fast responsiveness or full detail. This is directly related to the number of vessel icons on your screen with Full Detail meaning that you will be viewing all the available vessels at any time. Icons: select the size of the asset icons displayed on your screen. Smooth Animations: enable or disable Smooth Animations (e.g. when zooming in and out). Tap to access a series of How To articles in the MarineTraffic Help with brief instructions regarding the Oncourse app.